Head to Sandown this Friday for this free event organised by climate campaigners and enjoy the ﻿Pop-up marine natural history museum. The next international School Strike takes place this coming Friday, 12th April. Extinction Rebellion want to support youths and families on the Island and have organised this event. We welcome families to this free event which is being run by volunteers. We are meeting at the new Dino Islands crazy golf course, Culver Parade in Sandown by the playground. We have kindly been given permission by the owners for children to have photographs taken with the dinosaurs. We’re asking children to bring placards highlighting the environmental dangers we all now face. We will also have a loud speaker there, and anyone children who wish to give a speech may do so. We did the same at the last XR Youth event outside County Hall and there are many children who feel strongly about protecting the planet and want to say something. We will later be joining Ian Boyd from Artecology and Garry Oates from Blue Seas Protection on the beach opposite Browns Golf Course. Artecology will be hosting a marine pop-up natural history museum, and Blue Seas Protection will have lots of information about how dolphins and local endangered marine life need our help. 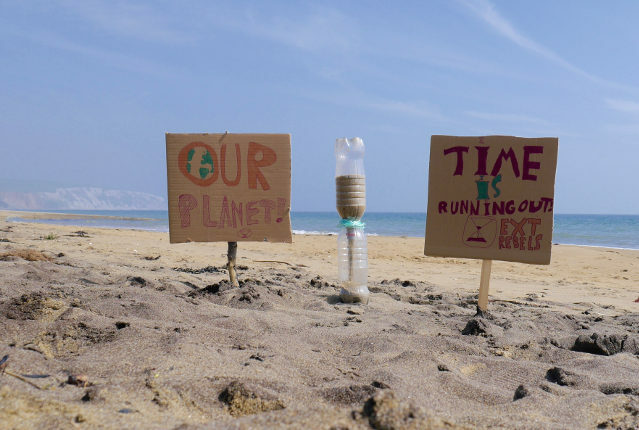 We are organising art activities , playing games, learning drum rhythms and making Extinction Rebellion egg timers to symbolise that time to act on climate emergency is now, and that time is fast running out. Letters and the poster have been emailed to all schools on the Island already so that they can let families know about this event. We look forward to meeting families on the day and to raise awareness on what can be done to help marine life that needs protecting.